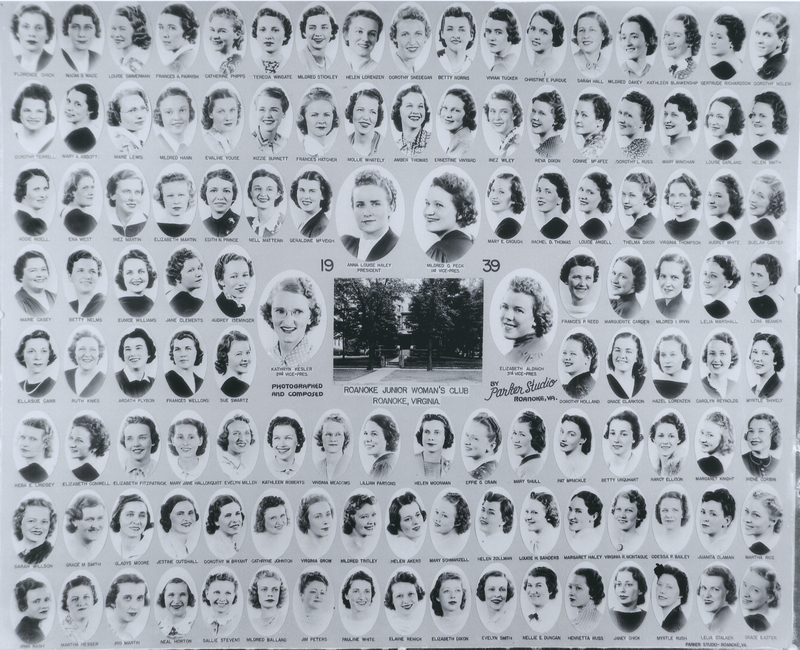 Composite photograph of Roanoke Junior Woman's Club members. Pictured are: Florence Chick, Naomi Wade, Louise Simmerman, Frances Parrish, Catherine Phipps, Terecia Wingate, Mildred Stickley, Helen Lorenzen, Dorothy Snedegar, Betty Norris, Vivian Tucker, Christine Purdue, Sarah Hall, Mildred Oakey, Kathleen Blankenship, Gertrude Richardson, Dorothy Nolen, Dorothy Terrell, Mary Abbott, Marie Lewis, Mildred Hann, Evaline Youse, Kizzie Burnett, Frances Hatcher, Mollie Whately, Amber Thomas, Ernestine Vinyard, Inez Wiley, Reva Dixon, Connie McAffee, Dorothy Russ, Mary Minichan, Louise Garland, Helen Smith, Addie Noell, Ena West, Inez Martin, Elizabeth Martin, Edith Prince, Nell Mattern, Geraldine McVeigh, Mary Crouch, Rachel Thomas, Louise Angell, Thelma Dixon, Virginia Thompson, Audrey White, Buelah Carter, Marie Casey, Betty Nelms, Eunice Williams, Jane Clements, Audrey Iseminger, Frances Reed, Marguerite Carder, Mildred Irvin, Lelia Marshall, Lena Beamer, Ellasue Carr, Ruth Knies, Ardath Plybon, Frances Wellons, Sue Swartz, Dorothy Holland, Grace Clarkson, Hazel Lorenzen, Carolyn Reynolds, Myrtle Shively, Reba Lindsey, Elizabeth Conwell, Elizabeth Fitzpatrick, Mary Jane Hallonquist, Evelyn Miller, Kathleen Roberts, Virginia Meadows, Lillian Parsons, Helen Moorman, Effie Crain, Marsh Shull, Pat McNickle, Betty Urquhart, Nancy Ellison, Margaret Knight, Irene Corbin, Sarah Willson, Grace Smith, Gladys Moore, Jestine Cutshall, Dorothy Bryant, Cathryne Johnson, Virginia Grow, Mildred Tolley, Helen Akers, Mary Schwartzell, Helen Zollman, Louise Sanders, Margaret Haley, Virginia Montague, Odessa Bailey, Juanita Claman, Martha Rice, Irma Nash, Martha Hesser, Iris Martin, Neal Horton, Sallie Stevens, Mildred Ballard, Jim Peters, Pauline White, Elaine Renick, Elizabeth Dixon, Evelyn Smith, Nellie Duncan, Henrietta Russ, Janey Chick, Myrtle Rush, Lelia Stalker, Anna Louise Haley, Mildred Peck, Kathryn Kesler, and Elizabeth Aldrich. Parker Studio, “PS 273 Junior Women's Club,” Virginia Room Digital Collection, accessed April 21, 2019, http://www.virginiaroom.org/digital/document/PS273.